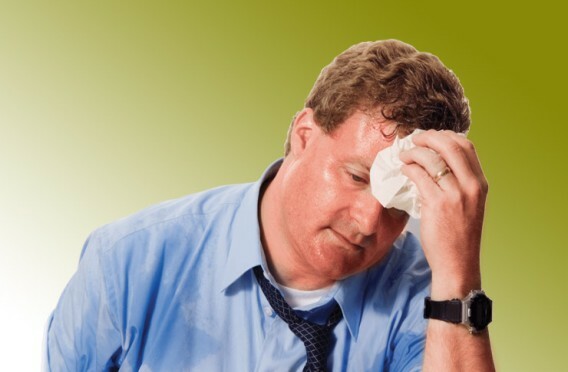 Excessive Sweating is a common experience that is been observed by many during hot periods, especially during summer. Because of the profuse amounts and rate of sweating that is been encountered by many during this period, there have been lots of assumptions going on concerning the heat intensity. Some people claimed that ozone layer have completely vanished, while others conclude that "hell" have been let loose, and it is the heat intensity emanating from there that we are experiencing at the moment. All these are funny assumptions. Though sweating is an inevitable natural phenomenon, it is quite embarrassing when you in the midst of colleagues and friends or when you are in an important meeting. The best you can do is to wipe off the sweat periodically by using a handkerchief, but unfortunately, the more you wipe, the more it keeps coming out. So you are just stuck with such an irritating and embarrassing condition. What is sweat all about? Sweat can simply be described as the fluid (or liquid) that comes out of the body through the pores in the skin, usually as a result of physical stress and/or high temperatures. The main purpose of sweating is to regulate the body's temperature (because when the fluid comes out of the body, it produces a cooling effect on the skin surface), and to excrete or remove certain products of waste of the body's system. Since sweating helps in eliminating wastes out of the body, then why are we complaining or having negative feelings about the profuse sweating rate that is being experienced now? The answer is simple, sweating does not only excrete waste, but rather it is been accompanied by a large amount of water. So, if huge amount of water goes out of the body, the body becomes hydrated and it can eventually lead to a lot of unfavourable health conditions. We tend to increase the intake of water during hot periods so as to compensate for the amount lost during sweating. Since the best way of handling any problem is too seek for possible solutions, i will love to share 10 different home remedies which you can apply so that this excessive sweat menace can be tackled and controlled. Since we all know that we do not have the power to stop or prevent the heat from coming, but there are few tips we can follow on our part to tackle the rate of perspiration. Without further discussion, read on as we expose some useful home remedies to tackle sweating during hot periods. Put about 10 grams of camphor in bowl containing coconut oil and apply it directly on the areas of sweat pores immediately after taking your bath. Allow it for about 45 to 60 minutes, then you finally wash it off with clean water. This will surely give you a desired result. Salt is another compound used in tackling the rate of perspiration. To cure increased rate of sweating by the use of salt during this hot weather, just follow these steps. Mix a table spoon of salt with lime juice, then you massage your hand with the mix. Massaging your hands with the mixture will reduce the activities of sweat glands. Maintain this on a daily basis to tackle increased sweating. Having a constant shower on a daily basis can also help in combating excessive sweating. It is ideal to take a bath using antibacterial soaps and ensure that you dry your body thoroughly after each shower. After each shower, you should also apply an antiperspirant. Antiperspirants are available in the form of powders, sprays and roll-ons. It is preferable to stick to pastel (light colour) shades because they tend to reflect the rays coming from the sun, unlike dark shades that easily absorb heat. Putting on hats that serves as a shade can also help. Applying teat tree oil in the areas of high perspiration is also useful in tackling it. It is excellent for oil skin, and the desired result can be achieved if it is continuously used on a regular basis. Potato is used in getting rid of profuse sweating. How can it be used? Simply cut some slices of potato and rub them gently under your arms and the areas that are prone to sweating. Allow the liquid to dry completely before putting on your clothes. This is one of the simplest way of getting rid of sweating. How can this be achieved? Simply engage in a regular drinking of just one glass of tomato juice on a daily basis, it will definitely help you in getting rid of excessive sweating during hot periods. Grapes are knows as a natural antioxidant, and they help in balancing the temperature of the body. Eating grapes on a daily basis is just another method used in tackling excessive sweating during hot weather contrition. Drinking just 2 spoons of natural vinegar and 1 spoon of apple cider vinegar is one excellent remedy in curing excessive sweating. What is the right prescription? Drinking the mixture 3 times in a day on an empty stomach 30 minutes before or after meals will ensure in giving the desired result. Now we have seen 10 different solutions in tackling excessive sweating in this hot period, adopting one or any of them will sure produce a desired result and you will have less reason to complain. If you find this information useful, feel free to share it to your friends, families and colleagues, because no one love been embarrassed by excessive sweating. Although these are all good remedies, they will not be able to provide you with long-term relief. I have suffered from hyperhidrosis for a really long time now, and I found that the best option to keep this condition under control is to use an iontophoresis machine. I have found that an iontophoresis machine is a lot safer and affordable, in comparison to other treatment options. I would definitely suggest anyone suffering from excessively sweaty hands and feet to look into using an iontophoresis machine.